This lesson will show you how to hide the display of attachments for a page. 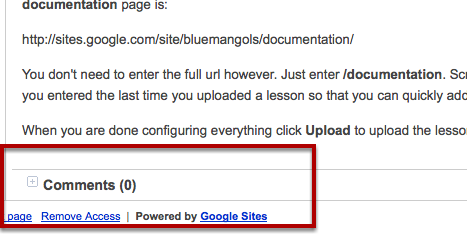 When ScreenSteps uploads a lesson to Google Sites it attaches any images as attachments to the page it creates. By default all attachments are visible at the bottom of the page. Unfortunately the Google Sites API does not provide a way for ScreenSteps to hide these attachments in the same manner that Insert > Image does when editing a page directly within Google Sites. The solution is to change the page settings so as to hide page attachments from view. 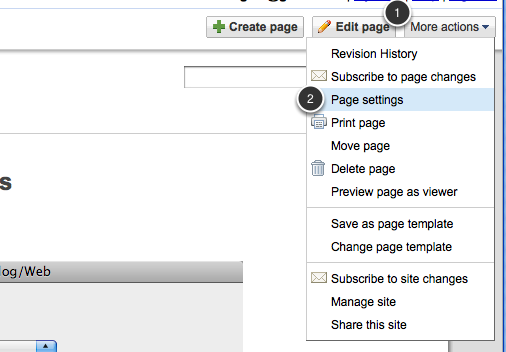 To do this click on the More Actions menu (1) and select Page Settings (2). Uncheck the Allow attachments checkbox and click Save. 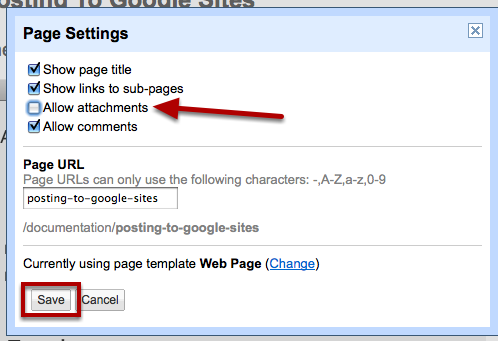 Attachments will no longer appear at the bottom of your Google Sites page. Is there a way to do this once and for all, for all pages published through ScreeSteps? @alex: not that I am aware of. I've filed a request with Google to add support for hiding attachments to their API. This would enable ScreenSteps to perform the action automatically when uploading images. As of yet the feature has not been added. We will be waiting eagerly to hear that this has been set-up by Google.